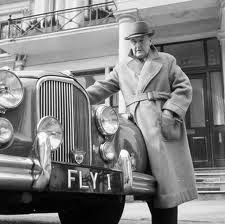 You have to admire a man like John Brabazon, not only for having an incredible license plate, but also for being the first person to fly a plane in Britain. And not only did he do that, but he also had a splendid plane named after him. A splendid, worthless, beautiful, useless, wonderful, horrible elephant of a plane. The gorgeous albatross was known as the Bristol Brabazon, and it was a sleek yacht meant for crossing vast oceans, but it was only for the extremely wealthy. The Bristol Brabazon was a living, breathing example how the most shortsighted dreams can still create something spectacular. Even while World War II was still raging, the Allies quickly figured out that they would win. And when you know what the world is going to look like after you quiet the hell that had been unleashed upon the planet, you start making plans. For the British, part of those plans included what the all-important world of transportation would look like. The war had given a great leap to the world of aerospace technology, and though it was horrific in every way, it gave a large boost to technologies of both transportation and war that we consider commonplace today. Transoceanic flights, space rockets, even cruise missiles all received their major spark of ignition during the war. And with visions of a shrinking world, engineers decided to see how small they could make it. But they had a problem. Britain had decided to devote all of its aerial resources towards combat aircraft during the war, as their needs primarily focused on getting the Nazis off their back, rather than shipping vast supplies of freight for hundreds, if not thousands of miles, leaving them with no designs for civil aviation after Europe lay in ruins. In an attempt to rectify this, the nation formed the Brabazon Committee, led by Lord John Theodore Cuthbert Moore-Brabazon, 1st Baron Brabazon of Tara, to determine the state of air travel after the war. They knew they would need planes for short hops, medium-haul flights, and long stretches to the vast outreaches of the dying Empire, but they had no planes to base their new paradigm on. The Americans, on the other hand, had transport planes like the Douglas DC-3 (and its military variant, the C-47), and the Boeing C-97 Stratofreighter, derived from the B-29 Superfortress. Both were relatively easily transformed into passenger planes, ready to take their first fare-paying customers immediately after the war. And though by no means were tickets on those planes cheap, air transport was still relatively utilitarian compared to traditional trans-Atlantic crossing methods, such as a ride on the RMS Queen Elizabeth. The designers at Bristol took one look at all the issues, and knew what needed to be done. They realized they could start from a blank, clean-sheet design. They realized that there was no one competing with the giant oceanliners for top-dollar passengers, and they realized that naming a plane after a very rich man, who had a very silly name like Lord John Theodore Cuthbert Moore-Brabazon, 1st Baron Brabazon of Tara, was a brilliant idea, as that association always works. What they failed to realize, for some bizarre reason, was the whole Europe-lay-in-ruins thing. And unrestricted by the petty restraints of mere reality, they set to work on building their dream machine. 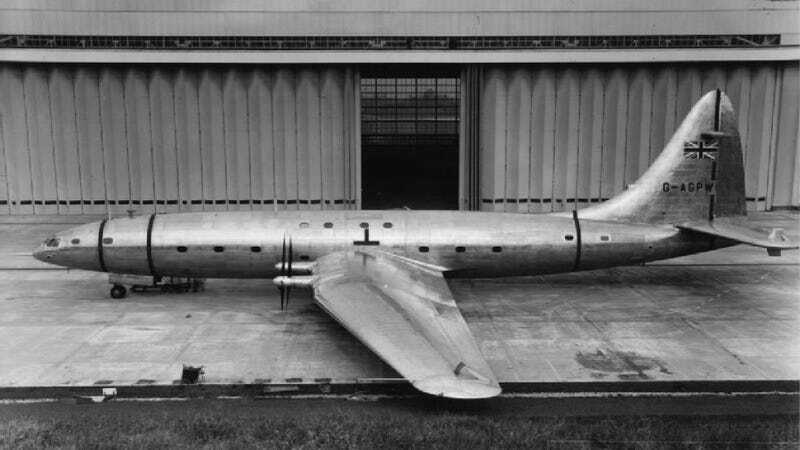 The resulting Bristol Brabazon was an immaculate silver bullet, shaped like few planes before it. It was sleek, it was luxurious, it was amazing. When it flew for the first time in 1949, it featured sleeper berths, a cinema, a cocktail bar and lounge, a dining room, and separate mens and ladies dressing rooms, because, well, you just have to look good for dinner. And its wingspan was larger than the one on a Boeing 747. The thing was, in short, massive. And immediately, no one wanted it, despite its good looks. England itself was still in the midst of severe rationing, as food and materiel of all types was still under wartime restriction, despite the cessation of hostilities being years old. Just by looking at the Brabazon, looking at what types of passengers and how many were needed to pay for its upkeep, and looking at the smoldering hulk that was an entire continent, provided incredibly easy math. The plane kept on flying for a few years, making regular stops at airshows and wowing the British public, but the business case absolutely refused to materialize. Very few would be able to afford a ticket, and that did not make for good politics on a project that the British government itself was subsidizing. Still, it looked pretty good. By October 1953, the Bristol Brabazon was scrapped completely. It wasn't even preserved for museum use. That's how much of an embarrassment it was. Less than a year later, the Boeing 367-80, the prototype for the Boeing 707, took flight. The resulting design, which brought air travel to the masses, revolutionized the way the world was seen. But it's not like the Brabazon was a total waste. It had a fully pressurized cabin, it had fully powered hydraulic systems, and electric controls, all pioneering developments of its day. Those advances, however and that gorgeous fuselage, weren't enough to save it from the scrap heap.